Luxembourg City can fly under the radar when you’re planning trips. Yet it offers so much history and beauty. Here you can tour fortress ruins fascinating enough to rate as a UNESCO site. And they come complete with a network of tunnels, known as casemates. So how did this fortress come into existence? The small country of Luxembourg, steered by the capital of Luxembourg City, sits at a strategic central location in Western Europe. Bordered today by Germany, Belgium and France, Luxembourg suffered invasions and takeovers over many centuries. Way back in 963, Count Siegfried spied the high rocky promontory on the edge of the city and ordered fortifications built on top of it. The fortress eventually boasted a ring wall and other defensive additions. The fortress was partially demolished in 1867, due to a neutrality treaty. 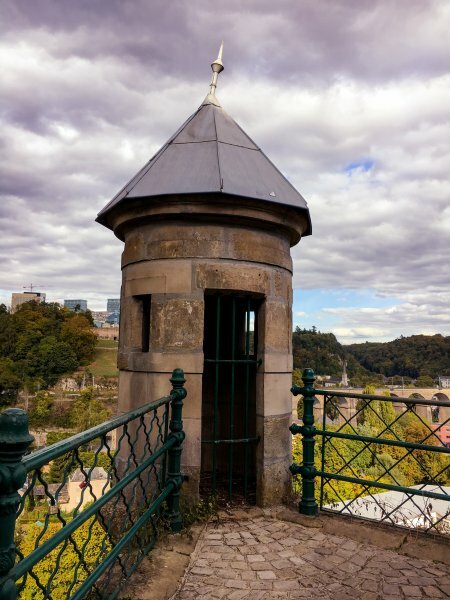 The task was obviously too difficult because today you can climb the remaining walls and marvel at the ruined parts of the fortresses popping up along the roads and among the greenery of Luxembourg City. When you visit, you can wind up a steep path that leads from the road below to the main portion of the ruins. If you prefer, you can take a free glass elevator that whisks you to an overlook. When you stand on the ramparts of the fortress, you can view the medieval layout of the city directly below. The modern and sleek Luxembourg City lies just beyond. The River Alzette flows peacefully along, as it has through all the iterations of this fortress. The tunnel system under the fortress, known as the Bock Casemates, are the product of Spanish and French ingenuity. They date to 1644, with more tunnels added in the 1700s by the Austrians. They reach as deep as 40 meters. While several branches of the casemates are closed, the main passage still exists and is open to the public. The tunnel system at one time contained 25 cannon slots for defense. The spacious casemates could serve as a barracks for hundreds of soldiers and their horses. 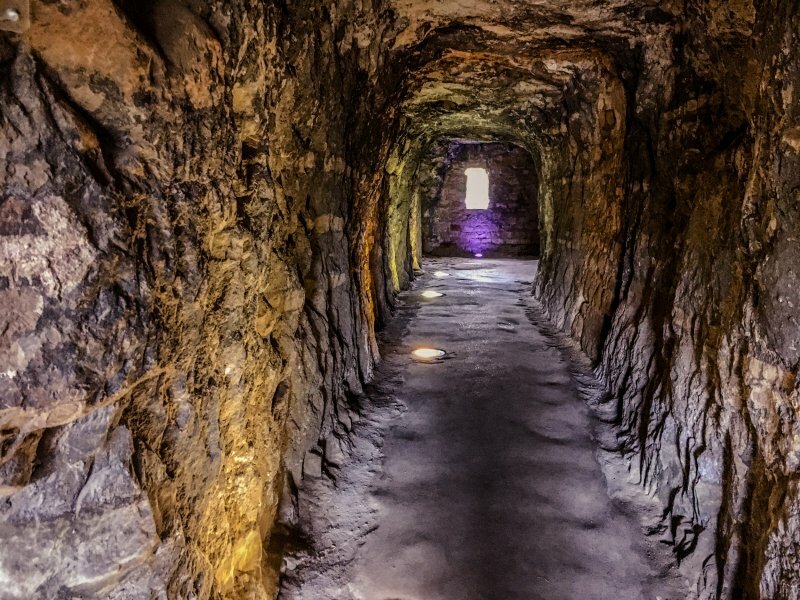 These tunnels also housed kitchens, bakeries and workshops. The underground portion of the fortress couldn’t be destroyed without causing parts of the city to cave in, so they were sealed up and left intact. In 1933, portions of the tunnels opened to the public. During WWII the tunnels were used as a bomb shelter. Today you can wander through all the open passages, about 17 kilometers worth of winding, dirt-floored passages. While electricity has been added, along with stair rails, you may want to use your phone flashlight to see where you are going in the darker areas. Every now and then, you can literally see light at the end of the tunnel. 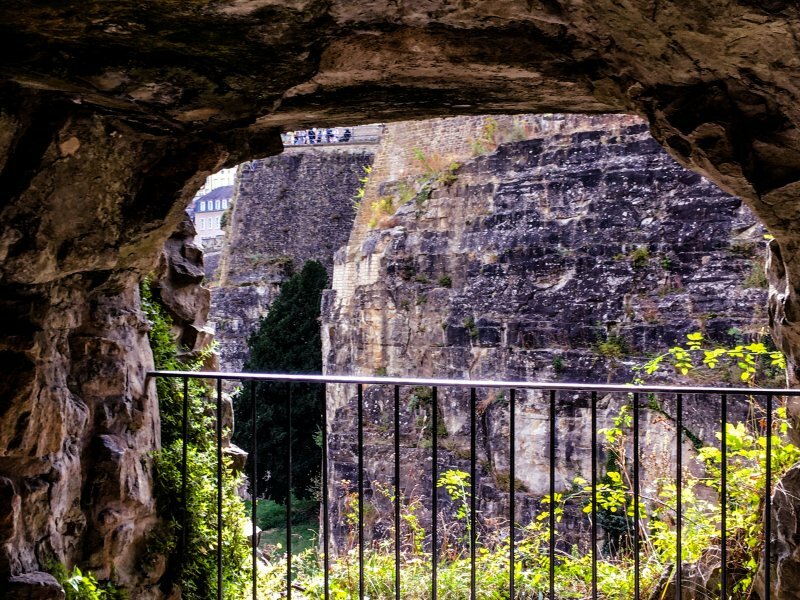 Emerge and take in a different view of Luxembourg City, then head back underground to explore more of the passages. The Bock Casemates are open from 10 a.m. to 5:30 p.m. daily and tickets are 6 euros. Allow at least an hour to explore.